Armin Hansen, Nino. Circa 1919. Oil on canvas, 50 1/2 x 60 1/4 inches. Monterey Museum of Art, Gift of Jane and Justin Dart. 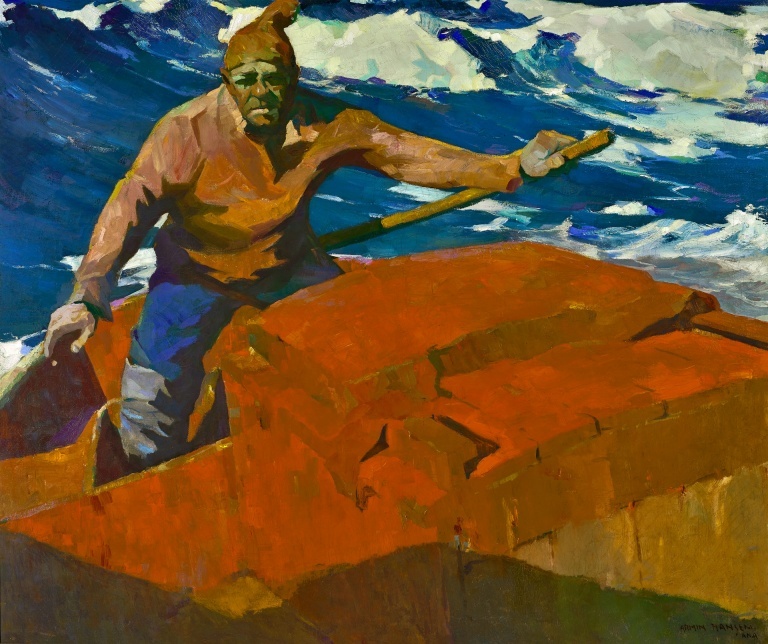 Armin Hansen (1886–1957) sought to capture the raw power and vitality of the Pacific and those who sailed it rather than the beauty of the ocean's light and color for its own sake. Although the San Francisco native at times painted lush still lifes, spirited rodeo scenes, and loosely rendered landscapes, his signature subjects were fisherfolk and the sea. Often described as Impressionist, Hansen's art departed from the calm and colorful beauty that characterized the style, even though he used bold colors and, at times, broken brushstrokes. For the most part, Hansen rejected Impressionism's gentility to focus on humanity's interaction and contests with nature. He did so with broad masses of color, dynamic compositions, and the elimination of superfluous detail. At heart a storyteller, he had an ability to create compelling narratives. His stories are told here through 100 works, including oils on canvas, watercolors, and etchings. The exhibition is organized by the Pasadena Museum of California Art in collaboration with the staff of the Crocker Art Museum. This exhibition is made possible in part by a grant from SMAC.